Well, as anyone living around here knows, it snowed ALOT yesterday. The boys didn't seem too interested in it at first, but as more accumulated on the ground, they started paying more attention to it out the window. They would look out and say "no," (meaning snow). They even had to tell it bye bye when they went to bed - and when they took their naps today. It was way too cold and windy to go out yesterday while it was snowing, but this morning was perfect for some outside play. 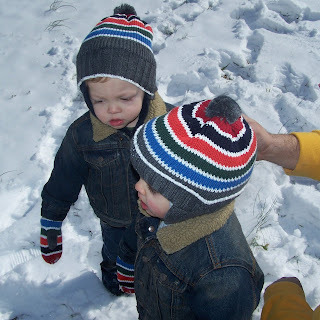 So, Phillip and I got the boys all bundled up and let them play in the snow for the first time ever. At first Hayden wasn't quite so sure what to do. He just stood in one place for a while, but then got the hang of walking in it. Carson took off from the beginning. Their Daddy even let them eat some snow - they really seemed to like that. 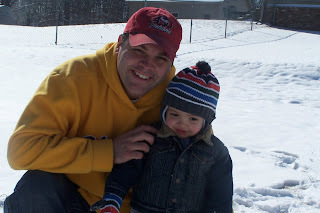 Here is a video of the boys' first time in the snow. The boys trying to figure out what they are supposed to do. 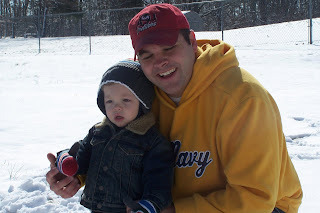 Carson & Daddy in the snow. 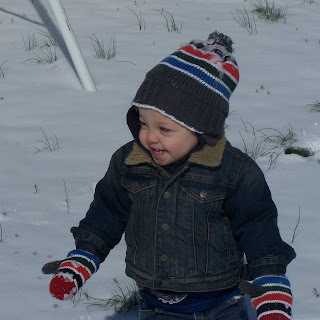 Hayden reacting to a snowball being thrown at him. 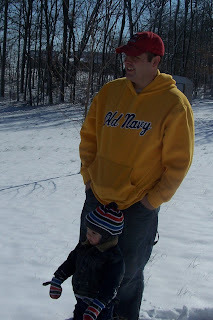 Carson & Daddy watching the 4-wheeler. It is funny that I got this picture of Carson, because it was Hayden who seemed so interested. I guess they are both going to be like their Daddy and like things that go "brrrrm." Here is one more video. Phillip was throwing snowballs at Hayden and Hayden was making the funniest faces. Unfortunately, you can't see his face that well. But, if you listen closely, you can hear that sweet laugh of his.